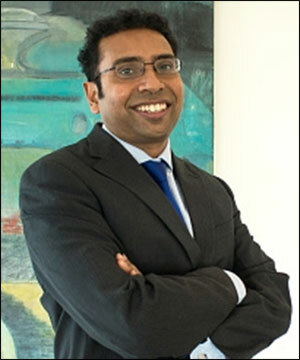 In a conversation with Hamsini Karthik, Saurabh Mukherjea, bottom, left,CEO, Ambit Capital, says he is advising clients to either take a genuinely long-term view on stocks or diversify the portfolio with stocks, bonds and gold for those with a short-term view. FY-18 could be another year of disappointment, he says. What’s your outlook on FII flows into India, given that central banks including the US Fed are reversing their stance on low or negative rates? For two successive years we’ve seen good FII flows in the first six months and then it conks off. Net FII flow is unlikely to be a big positive for at least 12 months. The US 10-year bond yield can probably range between 4 per cent and 4.5 per cent if there are three rate hikes. So sitting in America with no currency risk, risk-free returns are positioned at 4.5 per cent. FIIs will be tempted to stay back home rather than doing anything adventurous in emerging markets. Back in India, you neither have attractive valuations nor any real sign of economic recovery. Whatever tentative signs of recovery were there, they have been dampened by events post the November 8 announcement of demonetising high-value currency notes. So with bond yields running up in the US, it’s difficult to see how FII flows will come to India. The flows into markets will largely be from DIIs. Over the next 12 to 24 months, the dominant theme in India will be to record domestic inflows. If valuations are no cheap, what are the stocks that DIIs are going after? Domestic inflows have a disproportional tendency to go into mid-cap and small-cap stocks. FIIs are large-cap buyers and in the absence of FII money, there is a sluggish performance of large-cap stocks. So despite fundamentals not supporting do you expect the mid-cap and small-cap rally to sustain? That remains the big question. Mid-caps are reaching a checkpoint on valuations because of the increasing disconnect between economic growth. It’s been five months since we’ve had any encouraging credit growth in the country. We have a decelerating economy and there is a battery of matrix to show weak sales and demand in motorcycles and fast-moving consumer goods. After one quarter, we’ll be facing earnings pressure again. We believe that this market is overdue for a correction especially in small-caps and mid-caps due to poor valuations. How do you see the earnings trajectory in the next 12 to 18 months? FY18 will be the same old story, where the market will start the year with high expectations of 18 to 19 per cent growth and as the year meanders, they’ll realise the numbers are nothing close to expectations. The immediate quarter (Q4) could be good; we’ve had channel stuffing. But the biggest challenge will be for the financials in Q4. Logically the NPA hit won’t have shown up in the Q3 numbers. December quarter was only a decisive deceleration in loan growth. In Q4, NPAs will start showing and they will be full blown from the June quarter. Credit rating agencies are downgrading every single asset class -- from commercial equipment to micro-finance and loan against properties. They can see adverse developments in the securitised pools of receivables. You don’t believe that the asset quality pressures have peaked out. There’s nothing improving out there. In fact if SME, commercial vehicles and construction equipment assets that have been the mainstay of the banking sector for the last four years are seeing deterioration according to credit rating agencies. That will augment the corpus on NPAs. When NBFCs go to securitise the next tranche of receivables, the market will want a better yield on those assets. This will lead the NBFCs to hike their interest rates when the PSU banks are slashing rates. The NBFCs and Housing Finance Companies (HFC) are a broad church. Elements of these models will face existence issues over the next year or so as they are lending to parts of the economy that are highly cash-reliant. Those lending to salaried people or small businesses are fine, at best they may face margin compression. But the risk has more to do with the really juicy categories that have had a good time in the last 3 to 4 years. As the informal economy, which has thrived on cash, shrivels, the NBFCs and HFCs will come under pressure. Ironically, these are the sorts of lenders that are trading at the highest price-to-book value. All the NBFCs we cover have been recommended for sale. The transition from cash to digital economy will create major disruptions that the market is not factoring now. That does worry us. Where are the safe pastures then? My suggestion to our clients has been that, unless you are a five-year-plus oriented investor, this isn’t the right time to dabble in the market. It’s risky now. We are advising people to diversify their portfolio. We are advising people to buy gold and bonds in addition to equities. Ambit’s asset management division has launched a product which is a mixture of gold, bonds and equities. Over the last decade, a combination of the three asset classes has delivered 9 to 12 per cent returns without much underlying volatility. So either take genuinely long-term calls in such an over-valued market which is fraught with risk. Or if you are looking at a shorter horizon, diversify your portfolio. A lot of the people who are coming into the financial system now are people who are real estate refugees and equity first timers. My fear is their first experience with the market will not be pleasant and they will revert to fixed deposits or fixed income. That will be a shame. This time it can be worse. In 2007-08 gold and real estate were not dragging. It was just greed about the rally in equities. Now is a mixture of the two. It’s the greed vis-a-vis the mid-cap rally and fear generated by bloodbath that has taken place in the real estate market. The combination can be lethal for those who out of frustration with their property investments go head-long with the small and mid caps only to find six months down that they’ve lost their shirt. Is the low interest rate regime sustainable? The bank lending rate could fall aggressively over the next three years. We said in October that State Bank of India’s base rate can fall by 360 basis points. 90 bps is already done and expect 250 bps fall to happen in the next three years. This fall will be because of financial savings entering the banks. As cost of debt falls, companies which work on capital and land insensitive models like retail and cinema halls, who have historically avoided too much gearing will could see their debt levels increasing heavily in the next 2-3 years. Capital intensive businesses could become high return on equity generators and see rerating. Also for the first time, we will be creating businesses outside the IT and pharma cartel. Light-industrial manufacturers will benefit from the low cost of debt model. Is the Indian stock market pricing in the global uncertainties? Ironically the Trump event hasn’t hit the equity market as yet; they are hitting new highs across the world. Where one worries about is at some stage, the fact that country after country is electing nationalistic and aggressive leaders. Not only will global trade suffer but this will lead to conflagration. The risk is growing by the passing month and equity markets are utterly unprepared for this. The backwash of liquidity due to quantitative easing is still helping them. The logical risk that everyone talks about is the geopolitical tension between China and US. China is flexing its muscles all across Asia. We are in a strange situation. We touch the global risks but it doesn’t reflect on stocks. In India parallel to these risks, we have a slower economy, not reflected in prices due to heavy inflows. Diversification is very important as we don’t know what the next 2 to 3 years will bring.